WELCOME TO PRIME LIFE MINISTRIES: Let Jesus Carry Your Load. 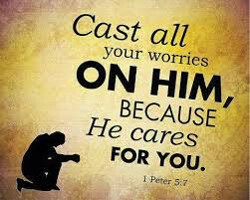 Carrying your worries, stresses, and daily struggles by yourself shows that you have not trusted God fully. It takes humility, however, to recognize that God cares, to admit your need, and to let others in God's family help you. Sometimes we think that struggles caused by our own sin and foolishness are not God's concern. But when we turn to God in repentance, He will bear the weight even of those struggles. Letting God have your anxieties calls for action, not passivity. Don't submit to your circumstance, but submit them to God who controls all circumstances.